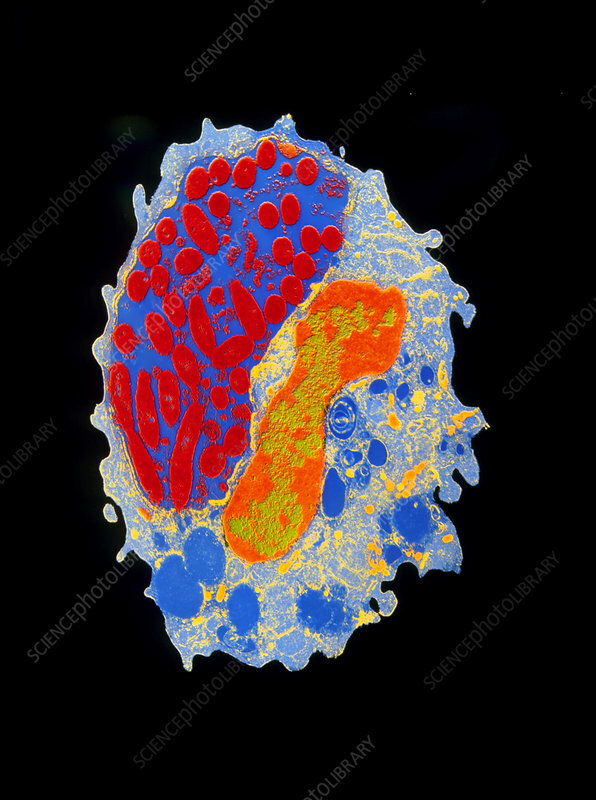 Coloured transmission electron micrograph (TEM) of a human lung macrophage which has engulfed the bacteria Legionella pneumophila. Macrophages are scavenger cells found at sites of infection; they remove bacteria or other foreign bodies from blood or tissue. At centre is the dumbbell-shaped nucleus (orange & green) of the macrophage. At upper left, in a cell vacuole (dark blue), are the L. pneumophila bacteria (red). As the agent of Legionnaire's disease, these bacteria cause pneumonia and other respiratory illness. Human infection occurs through contaminated water of air-conditioning or shower systems. Magnification: x5600 at 6x6cm size.